You know what this world needs? More Pokemon, of course. Thankfully, we’ll soon be able to capture the little critters no matter where we go as Pokemon Go preps for its mobile launch. And now we’ve even got some additional details and a couple of images of the game in action, too. Nintendo is making a smart move with Pokemon Go, creating a version of the game that can be experienced on a device almost everyone in the known universe has on hand at all times, a smartphone. Until now, though, we’ve only had a basic idea of what the game will look and play like. The folks over at Shack News recently got their hands on the first screenshots, though, as well as some additional details as to what we can expect out of the game. While nothing here is truly revelatory, we do at least get a look at what exploration is going to look like within Pokemon Go, and even a glimpse at Squirtle about to be captured. Pretty much anyone who has ever played a Pokemon game has likely thought to themselves how cool it would be if the pocket-sized monsters were real. Unfortunately, shy of netting actual animals and forcing them to battle one another, Pokemon Go is likely the closest we’ll ever get to living that fantasy. Pokemon Go uses augmented reality for players to find and capture various Pokemon, which they can then train, play with and then take into battle. According to the linked report, the game will keep things pretty realistic, too. Want to catch a water-type Pokemon? Head near the largest body of water you can find. To catch a ‘Mon, you’ll just need to toss a Pokeball at it and hope for the best. 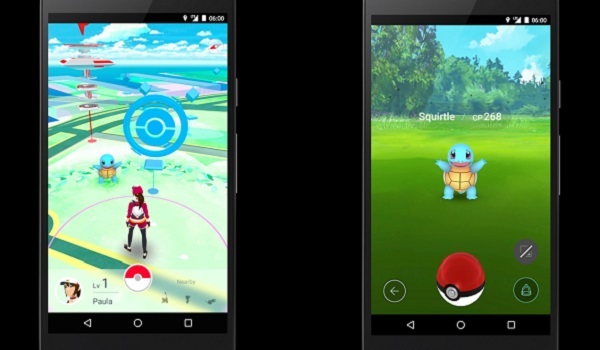 Those Pokeballs can be found at PokeStops, which will be cleverly located at local landmarks. That’s also where you’ll be able to keep an eye on Pokemon Eggs, which will hatch after you’ve walked around enough, just like in the regular games. Finally, you’ll have access to three gyms as well, which are similarly located at central locations. From there, you’ll be able to train up your Pokemon and compete in gym battles. Pokemon Go is due out later this year, making it only the latest in a long line of activities centered on the series’ 20th anniversary. Other celebratory activities have included the launch of special legendary Pokemon in the games, a massive Pokemon trading card art project, the re-launch of classic Pokemon games and the impending fall launch of the newest games in the series, Pokemon Sun and Moon.